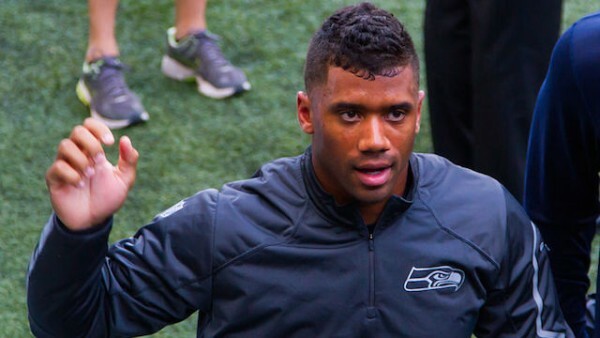 The Seattle Seahawks and Russell Wilson don’t seem to be going anywhere with their contract negotiations. He wants to be paid like one of the best quarterbacks in the NFL. The team clearly doesn’t think he is. Well maybe they do, but they also know that a big reason they’ve been so successful these last few years (two Super Bowl appearances, one championship) is their ability to do it with a quarterback that gets paid so little, allowing them to spread the wealth at running back and especially the defense, which has been the biggest and most important factor in the team’s success. Basically, right now, it seems like the Seahawks and Wilson won’t get a deal done for an extension, and that means the talks will end at training camp, and we’ll have to wait until February, when Wilson becomes a free agent (not exactly free). Wilson wants to be paid like a free agent now. But franchise quarterbacks, healthy ones, at his age, never end up being without a contract. The Seahawks will have plenty of decisions to make at the end of the 2015 NFL season. One of them will be Wilson. Use the franchise tag on him, which will go for around $23 million? And what then? Keep on trying to get a long term deal done, or try to trade him for two first round picks or something along those lines? The Seahawks clearly don’t think that Wilson is an inseparable part of their future, but are they really going to part ways with a quarterbacks that’s helped them reach back-to-back Super Bowls? Maybe they should have traded him before the draft. Maybe to the Buccaneers and get Jameis Winston and more out of it. Who knows. It doesn’t matter now. Wilson keeps saying he doesn’t mind playing out his contract, but he keeps saying other things as well, showing that he’s not exactly happy with being undervalued (in his opinion) by the franchise. Maybe Wilson has been blinded by the team’s success and is trying to make the most of it, thinking that it’s been about him before everything else. But clearly, the Seahawks think differently, not ready to pay him the kind of money we’ve seen Aaron Rodgers (the benchmark for Wilson’s next contract) and others get over the last few years. Maybe this season we’ll find out whose assessment is the correct one.